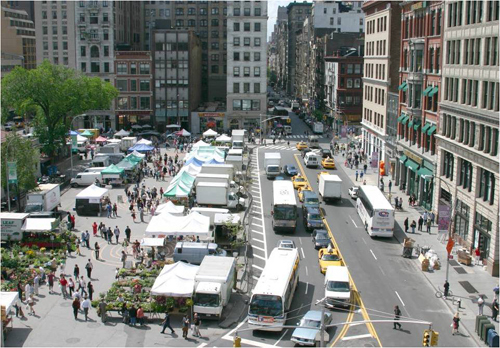 Successful public markets are the heart and soul of downtowns and neighborhoods, infusing our cities and towns with new energy and social and economic activity. Public markets, even if they only operate one day a week, act as an anchor for local businesses, encourage spin-off development, enhance tax bases and real estate values, and ultimately keep local dollars in the local economy. Markets attract new life to a downtown and encourage customers to spend more money and time, not just in the market, but in nearby shops and businesses. In a PPS survey of over 800 customers from a variety of indoor and open-air markets around the country, PPS discovered that 60% of market shoppers also visited nearby stores on the same day; of those, 60% said that they visited those additional stores only on days that they visit the market.